When you purchase anything new, you want it to last as long as possible—and this same thinking applies to your carpet. But if your carpet has to handle a lot of foot traffic, there’s not much you can do, right? • Take Off Your Shoes. Wearing your shoes while walking around on your carpet tracks in dirt, dust, and grime. This dirt gets ground down into your carpet and scratches the fibers of your carpet. The scratching wears away your carpet and dulls the color, making it still look dirty after you vacuum. If you feel the need to wear shoes in your home, use an entry mat to wipe your soles before entering your home or change to indoor slippers. • Vacuum regularly. Carpets should be vacuumed two to three times a week. If you wait too long in between cleanings, the dirt and grime will accumulate, and will be too much for a regular vacuum to handle. Make sure the brushes on your vacuum are not worn, and are not filled with hair or lint. • Stain removal. Clean up any spills as soon as possible. Any spots that stay too long on your carpet can result in a permanent stain. Make sure you blot the spot, and never scrub, as that can damage the fibers. Spray a gentle cleanser on the stain and keep blotting until the stain is gone. • Use professional carpet cleaners. Yet your carpet professionally cleaned once a year. They will deep clean your carpet and rugs to thoroughly remove the dirt and debris embedded into your carpet that causes wearing and dullness. 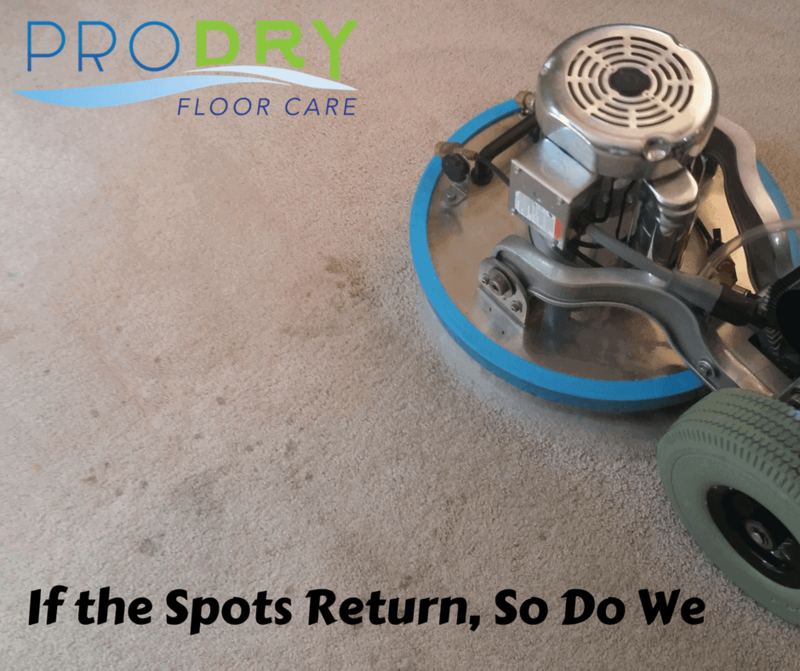 When you follow these tips from ProDry Floor Care, you can be sure to enjoy your carpet for a long time. Contact them at (513) 479-1291 or visit them online to schedule an appointment and to learn more about their low moisture cleaning method.